I primarily produce techno as well as dub techno and ambient. In regard to ambient and dub a lot of producers have noise and or tape hiss in the background. I know some of those producers, like Deepchord / Echospace actually record to tape and use analog gear, so hiss and noise are very prevalent with that method. I work within Ableton and don't use much outboard gear. Sometimes I'll record a track to cassette and then play it back to Ableton for some distortion as well as record cassette noise/hiss to sample. I've also done field records to get ambient background textures. But I am curious if anyone knows of any plugins that generate tape hiss or noise? I have the Waves Aphex Vintage Aural Exciter which has a noise generator in it and have had some decent results with that, but I am wondering if there is anything that offers more control. Thanks for any tips. Edit: There's also this beat for Reaktor, don't think it adds hiss but it's a fun effect regardless. Slate Digital Virtual Tape Machines has a noise function. Thank you for the tips! Those look cool and I wasn't aware of them. Awesome. I've never looked that in depth of the Slate Digital products. U-he Satin has a setting for noise volume and also wow and fluter and some other adjustments. And it also has a Tape delay and flanger modes. There is also Vinyl Strip by audio thing. And finally I think one of the best tools to introduce a lot of imperfections is XLN audio RC20, which has various modules with several modes for noise, ditortion, wobble. Very flexible. I've looked at Satin a bit and was considering purchasing it. I really like the u-he plugins. Thanks for the tips on the others. Honestly, since you already work with cassette tape and field recordings, run with that. The results are so much more interesting. If you have an analogue mixer, purposely bad gain-staging will bring out interesting noise textures from all kinds of devices. And if you actually feed your signals through these noisy signal paths, the noise textures will come alive and breath and respond to your material. From my point of view, the beauty of working with noise is this exploration of the instantaneous, the random, of catching these moments and making them your own. Where is the beauty in pseudo-random emulations? If it's about convenience in a production scenario, record long takes of your noise textures use compressors to make them respond dynamically to the other elements in your music. "Where is the beauty in pseudo-random emulations?" In the eye of the beholder where it always has been. Noise in machines wasn't by design. Noise in software is. Two sides of the same coin. That's a totally fair point. I still plan on exploring playing with cassettes and field recordings, but I'm just looking for any and all available tools that exist. 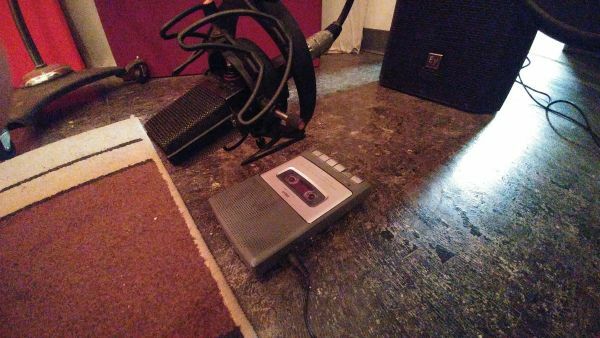 Can you run a VHS deck in record as a hardware insert in your DAW? Hope my answer can show you some ways that being interesting for you to explore and find stuff that you like and love! I also own the toneboosters reelbus but above max4live plugin can get much more extreme. +1 for XLN RC-20. Download the free trial demo and see what you think. I have Satin as well, but for adding ambient noise and/or getting BOC style VHS or cassette lo fi stuff, RC-20 is much more versatile. I typically use Satin on the master stereo bus as an analog tape emulator for overall warmth, RC-20 as an effect for individual tracks. Rod Modell of Deepchord has said in interview that he doesn't use hardware much these days, but that he has a large sample library of the hardware he used to use. In Ableton, try using the Erosion, Redux and Vinyl Distortion plugins. You can use one of Ableton's instruments, like Analog or Collision, choose a noisy waveform, turn up the noise, and then run through Erosion, Redux and Vinyl Distortion. Or just sample some noise and use that. I think it's very easy to get really nice noise in Ableton. Actually if you listen to something like the Deepspace presents Echospace Silent World album there is a lot going on sonically, it's dense and grainy but it's not necessarily analog noise. How about the Smackos Tape Station from Legowelt. It’s cool. It’s free. Legowelt made it. Not a plugin, but if record dead air with a mic or field recorder, you'll have a shitload of noise when you boost the signal. This plug in is working really well for me. Seriously tho, how about a cheap radio tuned to dead air? Edit: Double post. Please remove. Second the suggestion for Smackos Tape Station, it's great for tape hiss, it's funny cause it actually smears things together because of the hiss. Also I trialed a plugin called Sonitex stx-1260, which has every parameter in terms of producing lo-fi effects, definitely my favourite compared to others I've tried. Though it's Windows only and 32 bit. You could try reducing the bit rate of your samples aswel. Think audacity does this. Thanks for all the replies! I've got a lot of cool stuff to look through. I appreciate the tips everyone.